A couple of posts back we had a piece with words by Roy G. Dandridge who got called the “Paul Laurence Dunbar of Cincinnati.” Today’s episode’s words are by the Paul Laurence Dunbar of Paul Laurence Dunbar. Paul Laurence Dunbar. Young, Gifted, and Black. Dunbar grew up in Dayton Ohio, the Afro-American son of former slaves. In his town’s high school class of 1890, he was friends with another guy, a white guy, one who had varied enthusiasms. This other guy was a snappy dresser for his time, wearing newfangled wing-tip shoes, bowler hats, and a sporting a dashing waxed handlebar moustache. When the mandolin had a popularity boom, Dunbar’s classmate dude had to learn to play it, and he apparently drove his family around the bend as he practiced. Then later, the dude became interested in printing, and so designed and built his own printing press. He got so attached to printing and publishing that he dropped out of high school to start his own print shop with his brother. 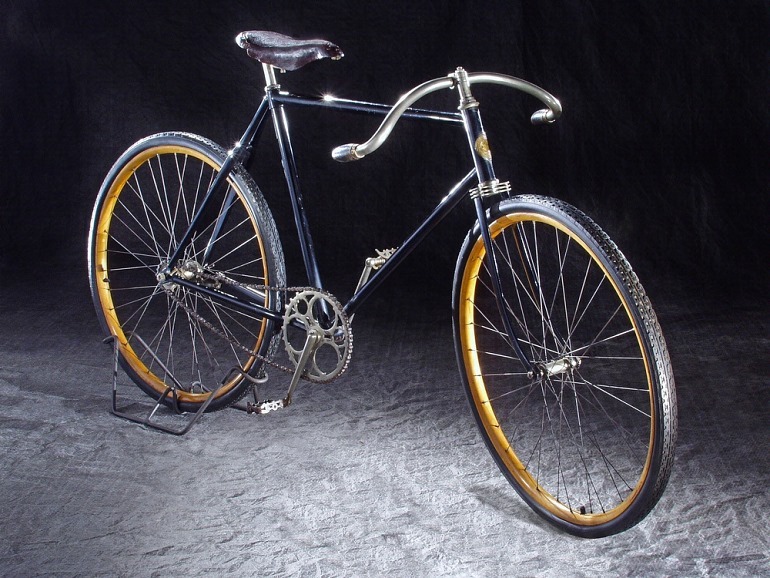 Then a couple of years later, the modern bicycle was invented, and his mechanical ability branched out to building, selling, and repairing bikes. 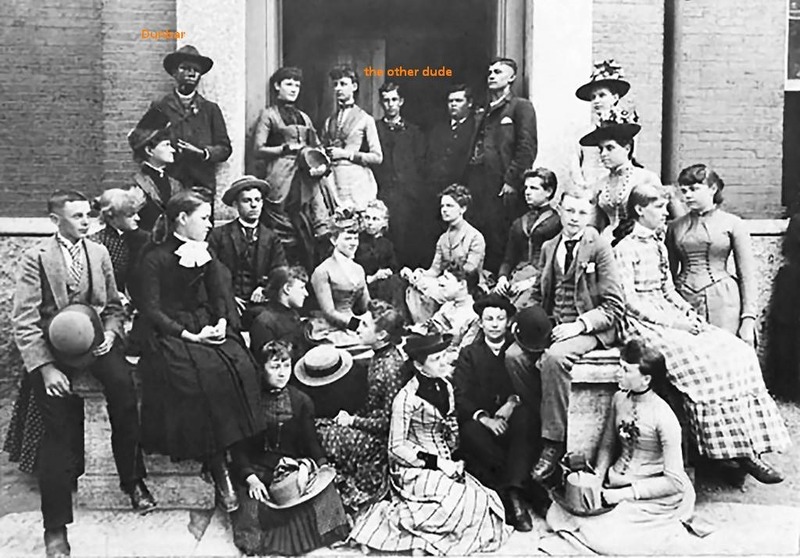 Dunbar with his high school class. Dunbar is in the upper left, our mystery dude in the shadows in the back. And what’s with the guy on the left in the front row, shouldn’t he be in a band or something? But let’s step back to that printing business. 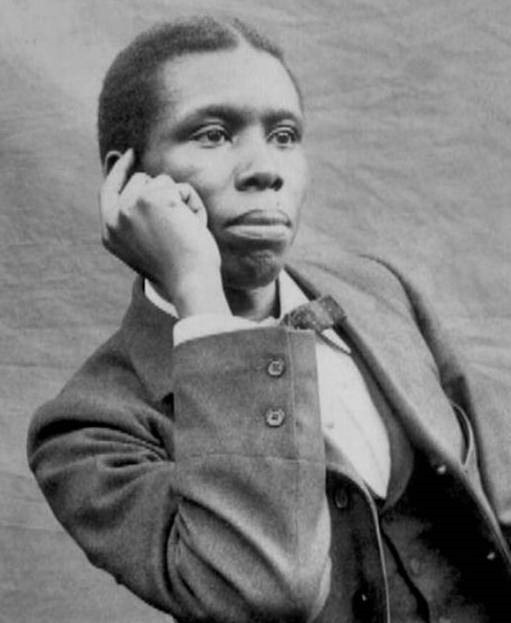 Paul Laurence Dunbar was already writing poetry as a high school student. After graduation, his family’s lack of funds and racial discrimination kept him from going to college, but he hungered to get into print. Our dandy, mandolin playing, designed-and-made-his-own-press print shop guy went into business with Dunbar and printed a newspaper that Dunbar edited and wrote for, even while Dunbar was still in high school–and then he used his connections in the business to get his classmate’s poems collected and published two years after Dunbar graduated from high school. Dunbar’s books gathered attention. James Witcomb Riley, Frederick Douglass and William Dean Howells reviewed him favorably. By the end of the 19th century he had toured England, gotten a job with the Library of Congress, and written the lyrics for a Broadway musical and collaborated on an operetta, becoming the first widely known modern Afro-American poet before he was 30 years old. The 20th Century awaited him. Then he contracted tuberculosis. His health declined, and though he tried to continue to build on his career, he died in 1906 at the age of 33. He should have been one the older generation of the Harlem Renaissance of the 1920s. He could have taken his mastery of the lyrical 19th century style, and like Yeats in Ireland, transitioned seamlessly into the forms and topics of modernist poetry. Alas, none of that was to be. Dunbar’s “A Summer’s Night” is a lovely, sensuous lyric. If one goes beyond the Victorian-drenched term “maiden” used almost as a refrain in the opening lines, and the slightly precious “perfumed bosom” of the southern breeze that closes the first half of the poem, the flitting last half that closes with carousing fireflies staggering home in the dark is just gorgeous It’s my hope that using our Parlando Project tactic of performing these words with music lets one more easily accept the sentiment of the more archaic words. So, what happened to our mechanical aptitude dude, the guy who’s printing press began printing Paul Laurence Dunbar while they were High School classmates, helping launch the career of America’s first widely known modern black poet? This bike looks pretty sweet even today. Dig the mono-tube rear stay, the tri-plane front fork, and the flipped moustache bars. Turns out bicycles were one of the seed technologies of the 20th century. Our dude knew how fabricate his own stuff, and make it strong and light. The dude was named Orville Wright and he and his brother Wilbur took the modest profits from their printing and bike businesses, and three years before Dunbar died, they designed, built and flew the first airplane. There was a lot of disbelief that a high-school dropout from a hick town could do any such thing. Pioneers like Paul Laurence Dunbar and Orville Wright had to do it, otherwise no one would believe it. To hear my performance of Paul Laurence Dunbar’s “A Summer’s Night” with music, use the player below. And thanks again for liking, following, and sharing.